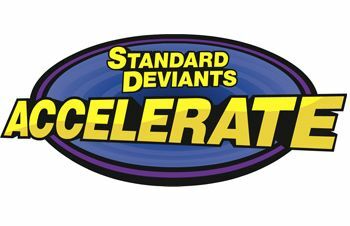 If you are looking for an online supplemental course, then you should check out Standard Deviants Accelerate. Standard Deviants Accelerates (SDA) is an online membership based site that hosts a huge assortment of courses such as Algebra, AP Biology, Nutrition, U.S. History, Earth Science, etc. Most of the courses are geared to the middle and high school ages, with an Arithmetic class available for 3rd grade. For this review, we were blessed to receive a full year's access to their line of Homeschool Courses. How It Works: As I mentioned above, there's a huge assortment of classes. SDA is a very organized program, so even though there is a wide assortment of classes, they are easy to navigate. When you register, you are given a master account. This is where you add students to your account, and also add them to specific classes. Note: Each student will need their own independent email account to be registered as a student. If you have multiple students, you can assign them individually to specific classes, instead of having them all do the same thing. You can also view the overall class percentile, which I think is pretty interesting if you have multiple students doing the same class. In addition to that, you have the ability to view progress reports for each student, making grading and record keeping a breeze. From the student side, the classes are also very organized to streamline progress and reduce distractions. When you choose your subject, you will find a menu of sorts, as you can see above. The subject is broken into subtopics, and each subtopic into lessons. As you can see from the graphic above, I've chosen Algebra to illustrate this. Here's where the great organizational aspect comes into play. Each lesson then has tabbed sections. First there is a video you can watch, with a printable transcript- OR you can actually scroll along and follow a transcript on the side. In addition to that, a great feature is the note area. As your child/student watches the video they can take notes. Then, they can either print these notes or save them for later. After the video there is a Vocabulary tab. This holds true for each subject we have tried out thus far for this review. 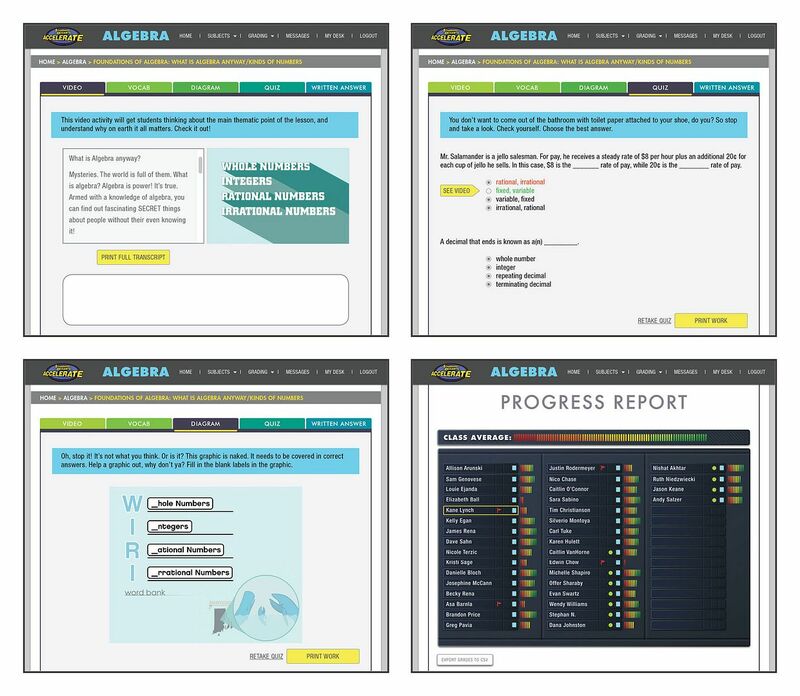 The Vocabulary tab will reinforce specific vocabulary words from the current lesson. The Quiz tab is pretty self explanatory. It is a quiz on the lesson. The quizzes are extremely short. at just around 5 questions each. After all of that, there is a critical thinking component to each lesson with a written answer question. This portion asks the same two questions each time, and has your child think critically in order to answer it. First, I would like to point out how accommodating and expedient the customer service was in helping me when I could not get my son registered. I was assisted in not only registering him, but having him added to the classes. Each course is fleshed out nicely, and I like the ability to print the transcript to follow along. That is beneficial to students who have difficulty focusing, such as is the case with ADHD and Autism. The note taking ability is also a great way to reinforce that skill, which to me is very important, especially on the collegiate level. Printing the notes or saving them is also a nice feature. I wish the quizzes were a bit longer. I don't think 7 or 10 questions would be too much, but I don't feel as if 5 is quite enough. Being honest, I like the written answer part, but not after each lesson. I think a better option would be to either have that as an optional component or as a bonus points objective. That way the parent could choose if they wanted it after each lesson, or perhaps after each subtopic. I understand the point and reasoning behind it, and it is a good one, but I would like more flexibility there. This membership program is really great if you have multiple students. It works well with only one student, but if that one student needs more than one course, it could run into a bit of money as you have to choose and pay for each class individually. Each class allows you to add up to 4 students to the class. Most classes are a monthly subscription of $9.99 and some are $4.99. So if you needed 3 classes, that could be as much as $30/month. There is an option to purchase all of the classes and have a lifetime membership, but again the cost could be a concern for some. I would like to see an option where a parent could choose a plan that would allow full access for a set amount of time, perhaps 3 months, and pay either per student (with a discount for additional students) or one set price for the family. Or maybe even a package deal where a parent could choose multiple subject areas for a bundled price. I would also like to see printable work. Mr. B does quite well with paper work. I think it helps to ground his attention and focus. He preferred to access the courses online, but do the work on paper. Sometimes, he prefers online, and others paper. This was just one of those times he wanted paper. A print option for the quizzes would be great. There is a "Print Work" option for the quizzes, but it will not print the quiz before answers are down. Does Standard Deviants Accelerate Pass My 4 Ingredient Test? You can easily skip ahead and move around as you need. You can't modify in the sense of printing and doing the work that way, but you can set your own schedule, take breaks, etc. This is the question I struggle with. First, there are no hidden fees, and the subjects can be multi-grade, but within reason. high school classes would cover most high school ages, and so on. Next, there is a full year's worth of content for each subject. With that said, membership is only 1 month, and it is PER subject. So if you sign up, you are not paying 9.99/month to access all of the subjects, but only 1. And only 1 for up to 4 students. So if you have 5 students who each need their own course, that's going to be 9.99/month for each subject, and only 4 of those students can access the subject. The bright side to that is that you don't pay for it longer than you need it. Ok, the videos are a BLAST. I love the varied actors, the costumes, the enthusiasm. The videos are GREAT. I stress GREAT. They are varied and attention grabbing, and really good for ADHD students. Autistic students may or may not enjoy them, it all depends. it depends on if they have issues with the characters. In the case of autism, I would suggest the 7 day Free trial to do a test run with your specific student. I see this as more of a supplemental program to use in conjunction with things you may already have. As a supplemental product, it is very fleshed out and great. The whole point to a supplement is that it works with what you already have, and this would do just that depending on the subjects chosen. To read more reviews on Standard Deviants Accelerate, please check out the Schoolhouse Review Crew! Just click the banner below!